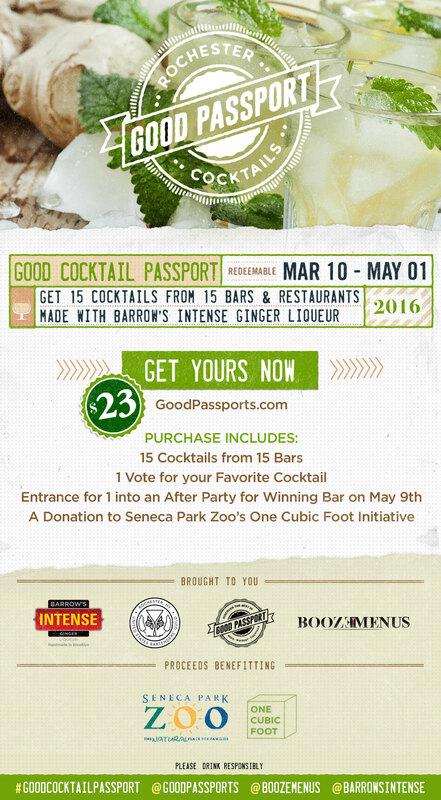 Good Passports, BoozeMenus along with United States Bartenders Guild of Rochester and Barrow’s Intense Ginger Liqueur present the Good Cocktail Passport which will act as a fundraiser for the Seneca Park Zoo Society’s One Cubic Foot Initiative. By purchasing the Good Cocktail Passport, you’ll get one demi-cocktail made with at least .5 oz of Barrow’s Intense Ginger Liqueur at each location, plus entrance into after party. You can use the passport on any day, at any time from March 10, 2016 through May 1, 2016. Each of the bars involved in the Good Cocktail Passport are participating in a contest to see which one makes the best cocktails and you get to decide the winner! At the end of redemption, you’ll get to vote for your favorite bar. The winning bar will host a victory party on May 9, 2016 and your Good Cocktail Passport is your ticket to attend. The winning bar from the competition will select their favorite charity organization and donation will be made in their name on behalf of Good Passports. When purchasing a Good Cocktail Passport, choose the location where you would like to pick up your Passport. Passports are available for pick-up from March 10, 2016 through April 10, 2016. Pick up your Passport at the location you chose any day from March 10, 2016 through April 10, 2016. Bring your Passport to each of the participating locations any day from March 10, 2016 through May 1, 2016 and choose one cocktail made with Barrow’s Intense Ginger Liqueur. Good Passports work with bars, restaurants, breweries, distillers and alcohol retailers to drive in customers by creating limited-time promotions with multiple venues. Customers acquire a Passport that guides them around a city where they get to sample various drinks at a number of different locations. By purchasing a Passport, customers also receive a periodic email newsletter alerting them of cool and exclusive events from the participating locations.